Like what you see? Be sure to share my content using one of the share buttons! 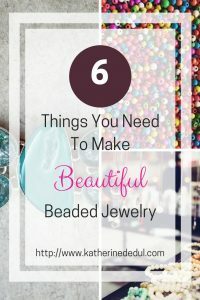 So you want to make lovely beaded jewelry pieces. You have to be, you’re here! 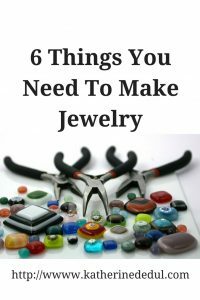 Truthfully you don’t need a lot to get going, particularly if you are new to beading. You just need about six different tools to make your first project, which I’ll go over below. Many craft stores offer a plier kit, if it’s in your budget to buy, I highly recommend it as it’ll have basically what you need to get going, I have since treated myself to a super sweet kit through Amazon, this kit has everything. 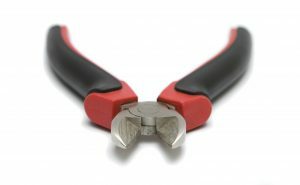 However, if this isn’t in your budget, you can really get by quite happily with three types of pliers as below. 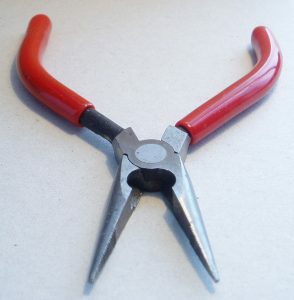 I’ve put this with the pliers because it looks like one, but it is used to ‘crimp’ the crimp beads onto the wire, thereby securing your beads on the wire. There are numerous techniques to use with this little guy, I often use youtube videos when trying something new. My kit that I bought had all three of these, I find these are useful for holding findings or even your project in place while you apply something new to it. It can be hard to grip those jump rings, so I would recommend needle nose if you can get them as they narrow down which will allow you to grip smaller items with a bit more ease. 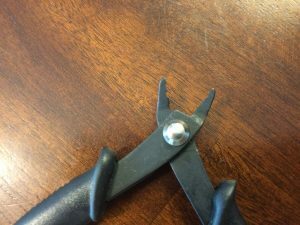 You need something to snip off the wire, scissors may not work properly for you, but a wire cutter can offer the precision needed. The three more popular items you’ll want from findings are crimp beads, jump rings and your preferred clasp. These primarily come in gold and silver, you’ll want to get a package in your preferred metal choice. I typically choose gold for ‘warm’ colours, like yellows, oranges and reds and silver for the ‘cool’ colours of blues, greens and purples, but it’s really down to designer preference here. The difference between crimp beads and tubes is that the tubes are a bit longer. I personally prefer tubes to beads as I find they’re easier to work with. The beauty of designing your own necklace or bracelet is you get to choose the closure! There are dozens of closures available, probably the most popular is the spring ring closure. Pick whichever one will be secured easily enough to a jump ring or a wire ring. Just a package will do of those. I would stick to the same metal as the previous two items. You’ll also want a jewelry grade wire (again keep it simple, pick the metal to match your other items). I don’t recommend going super cheap on the wire because cheap wire will break and you’ll have to re-do your project. You don’t need to blow your budget on it, but a mid-range tarnish-resistant wire will do very nicely. Look for around a 20 gauge width, it’ll be listed right on the package. Beyond those basics, I recommend getting some sort of container (the more compartments the better!) to keep all your loose beads in. I also recommend having some tape handy, if you don’t have a bead board (a flocked board specifically designed to hold beading projects), tape can help temporarily secure your project so it doesn’t wind up on your floor in a thousand pieces. Finally, you’ll need is your beads for the project. When buying for your project, I always recommend buying a little extra. Sometimes the beads are deformed through the manufacturing process and even more likely you’ll have underestimated how many you’ll need for the project, especially at the start! Whatever you have left over can always be re-used for another project down the line.